Should You Hire Freelance Writers? Most companies need fresh content from time to time. But because their need might not be on a regular basis, hiring freelancers may be more prudent than hiring a full-time employee. There comes a time in every organization’s life when new copy becomes a necessity. Whether it be for new web pages, an updated company history, or an in-depth white paper, you’re going to need the right person to do the job. When you find yourself in that position, do you task your HR team to hire a new employee, or do you tap your network for a referral to a trusted freelancer? The decision isn’t as hard as it may seem. It really boils down to your business type and long-term content needs. You also have no long-term commitment to the freelancer. Once the job is done to your mutual satisfaction, there’s no potential for a nasty breakup. And when you need one again, you hire one. What could be easier? That’s not to say that freelancers can’t be part of your growth as well. I’ve had many copywriting clients hire me several times for new original content. I’m as involved in their success as I would be sitting in their office every day. However, there could also be a third option. You already have a full-time staff., so why not let them write the copy for you, even if copywriting isn’t part of their skill set? That’s somewhat akin to letting your plumber fix the brakes on your car, even if they are a bit of a backyard mechanic. For example, let’s say you need the aforementioned white paper written. You already have someone on staff who, among other things, writes the occasional blog for you. Should you hire a freelance white paper expert, or task your blogger with something they’re not experienced with? Believe it or not, white papers and blogs require two somewhat different skill sets. In this case, the freelancer is your best bet. They will be able to get the job done faster, and produce better results than someone whose specialties lay elsewhere. Not only that, you’re saving your internal resources to do exactly what they do best. Which is why you hired them in the first place. In the end, determining how often you’ll need new content may be the deciding factor in determining whether you hire a freelancer to supply original content. But if your needs suggest so, why not try a freelancer? I’ve worked with lots, and I’m happy I did. Have you worked with freelancers? Tell us about your experience in the comment section below! http://editorsdesk.net/wp-content/uploads/2016/10/bigstock-Attractive-Asian-Businesswoman-21819962-min.jpg 1867 2800 Richard Todd http://editorsdesk.net/wp-content/uploads/2017/06/the-editors-desk-logo.png Richard Todd2015-01-26 18:09:352017-06-10 19:32:22Should You Hire Freelance Writers? Great business writing is within your reach, if you’re willing to go beyond the basic fundamentals of written English. Here are three quick tips to supercharge your written copy! When you think of essentials in business writing, what comes to mind? Correct spelling? Proper grammar and punctuation? Knowing the differences between “their”, “there”, and “they’re”? Yes, these simple rules are important. But truly great business writing goes beyond these basic fundamentals. Check out these three tips to supercharge your written copy! So, why do your customers come to you? Clearly, it’s because you’re the expert in your field, and they need your help. But help with what? You won’t know when they come to your website, because there’s no opportunity to ask them. You need to anticipate what your customers will need before they come to you, and tailor your copy appropriately. For example, if you’re in financial services, what do your customers worry about the most? Financial security? Long-term income? Retirement savings? Address these concerns in your copy. Spend less time talking about you, and more time discussing how you can help your customers realize their dreams. After all, I don’t care how many letters a financial advisor has after his or her name. My only concern is that they help me achieve my financial goals. Anyone who has ever worked with me knows I’m I big proponent of Simple English, often using a computer store scenario to demonstrate its effectiveness. If you confuse your customers with fancy tech talk, they’ll spend too much time trying to figure out what you’re talking about, and not enough time hearing your message. Not only that, you risk making these potential customers feel “less than”. It’s always nice when your knowledge is recognized, but if you employ a bunch of industry terms and fancy lingo when communicating with a layperson, chances are they won’t be engaged. In other words, if they can’t understand you, they may not think you understand them. It would be great to discuss quantum theory with Stephen Hawking, if I could speak on his level. Perhaps I’ll save it for Neil deGrasse Tyson. When you get right down to it, you’re not creating copy to simply show off your writing chops. You’re trying to get your readers to do something. I recently wrote copy for a specialty food store. The goal was more than showcasing the owners, their neighborhood, and their products. My mission was to write copy that induced a hunger response. For example, visualize a cheese wheel. How would you describe it? You could just write “cheese wheel”, but a better idea would be to describe the cheese’s subtle pungency and nutty, buttery taste, that will literally melt in your mouth. Another example would be a button that you’re dying for the reader to press. Easy phrases that start with “Learn more right now…”, “Download this valuable document…”, or “Benefit today from…” can go a long way to getting your readers to do what you want, thus keeping them on your website. Great business writing is within your reach. 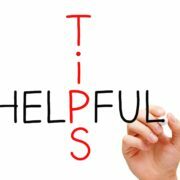 Following these three tips will help your content stand above your competitors, thus increasing customer engagement.